No cigar for me this time, alas. 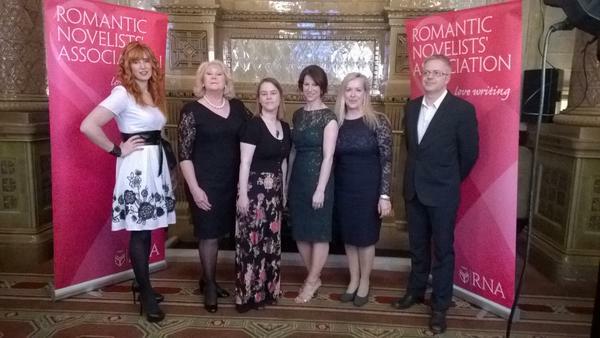 The winner in my category was Hazel Gaynor, for her Titanic novel, The Girl Who Came Home. Strong Irish contingent for this one as she was in this category along with me and Stephen Burke (far right) while Ciara Geraghty was also shortlisted in the Contemporary category. Hazel and I are in the centre, she looking resplendent in green. It was lovely meeting the other authors – Hazel I had chatted to on twitter and it was great to meet her in the flesh. She is a wonderful, warm, engaging presence and many congratulations to her for winning the historical category. (The overall award was won by Joss Stirling for her YA novel, Struck.) I also got chatting to Ciara Geraghty, who is a sweetheart, and Vanessa from Writing.ie who is a neverending whirlwind of energy and had a nine o’clock meeting the following morning. Stephen Burke was also a pleasure to chat to, lovely unassuming guy and I am really looking forward to reading his and Hazel’s novels (I’ve already read two of Ciara’s.) The plan had been to read them before the event but I didn’t manage to catch up with my reading fast enough alas. And thanks for course to O’Brien Press for helping organise it all and the Romantic Novelists Association for hosting a nice party. Work tomorrow seems very anticlimactic.